Hat Yai International Airport is a major airport serving southern Thailand. Our Hat Yai International Airport guide provides airport contact details, information on the airport terminal, and offers nearby accommodation options. The airport is undergoing expansion to accept a 4.5 million passenger capacity by 2018 and a 10 million passenger capacity by 2030. There is an airport information desk on the first floor of the terminal, near the Domestic Arrivals Hall. From Hat Yai city centre, make your way to Route 2029. Follow Route 2029 and continue onto Route 4135. Follow Route 4135 to Hat Yai International Airport. The drive time is approximately 30 minutes. Hat Yai International Airport is located approximately 15km (9 miles) from Hat Yai city, Thailand. Coach: There is a blue public minibus service that runs from Hat Yai International Airport to Hat Yai Bus Station, with several stops in between. Tickets for this service cost between 20 to 30 baht depending on where you want to go within the city. Taxi: A taxi desk can be found outside the Arrivals Hall of the terminal, between Gate 7 and Gate 8. The journey from Hat Yai International Airport to Hat Yai city centre will cost approximately 250 baht. ATMs are located on the first floor of the terminal. There is also a currency exchange counter on the first floor, just outside of the International Arrivals Hall. There are several restaurants at Hat Yai International Airport and a few small shops selling snacks, drinks and coffee. Dairy Queen and Dunkin’ Donuts have locations on site, as well. Hat Yai International Airport has a selection of souvenir shops and two main duty-free shops: one in the International Departures Hall and one in the International Arrivals Hall. Left-luggage facilities and a lost property service are available within the terminal. Passengers can contact the airport information desk directly for assistance. Alternatively, passengers can contact the Thai Airways International desk on the first floor or the office of the airline they are travelling with. Hat Yai International Airport has several prayer rooms (Muslim and Buddhist), a Thai Royal Orchid Business Lounge, a VIP room, medical facilities, a smoking room and a spa within the terminal. Hat Yai International Airport does not provide any conference facilities for passengers. However, you can access such services at Centara Hotel Hat Yai, which is located 20 minutes away from the airport. The hotel offers several meeting rooms that are fully equipped with projectors, screens, TV and video facilities and Wi-Fi access. Free Wi-Fi access and phone charging ports are available at Hat Yai International Airport. There is a post office located in the terminal of the airport. Public telephones are also available. Assistance can be arranged by contacting the airport (tel: +66 7422 7000) or your airline directly. 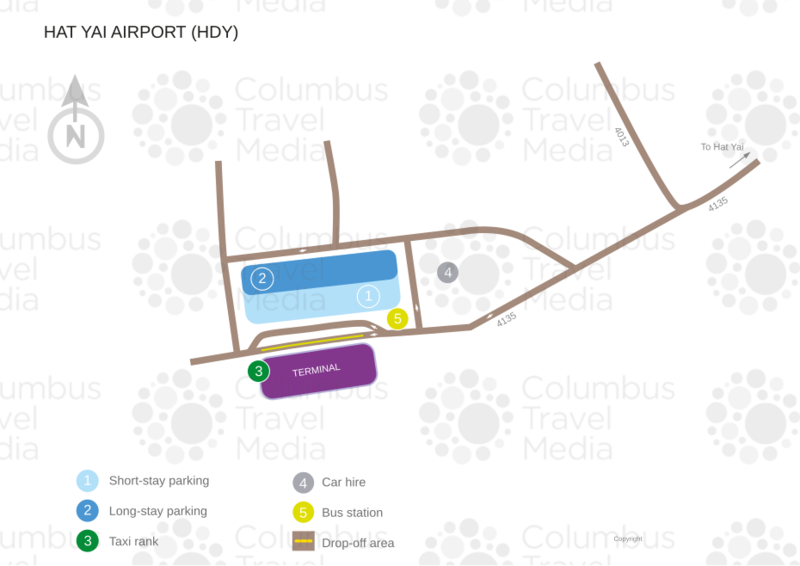 There is a short-term car park at Hat Yai International Airport. The first hour costs 10 baht, the second hour costs 20 baht, and the third hour costs 35 baht. Parking after 4 hours and up to 24 hours costs approximately 100 baht. There are many car hire companies available at Hat Yai International Airport, including Alamo, Avis, Budget, Europcar, Hertz, Sixt and Thrifty.